Like many others, I am always in search for easy and delicious one pot meals. Unfortunately I have found they are few and far between. This is a great one for a weekend, or if you have an opportunity during the week to assemble and bake a couple of hours before dinner. 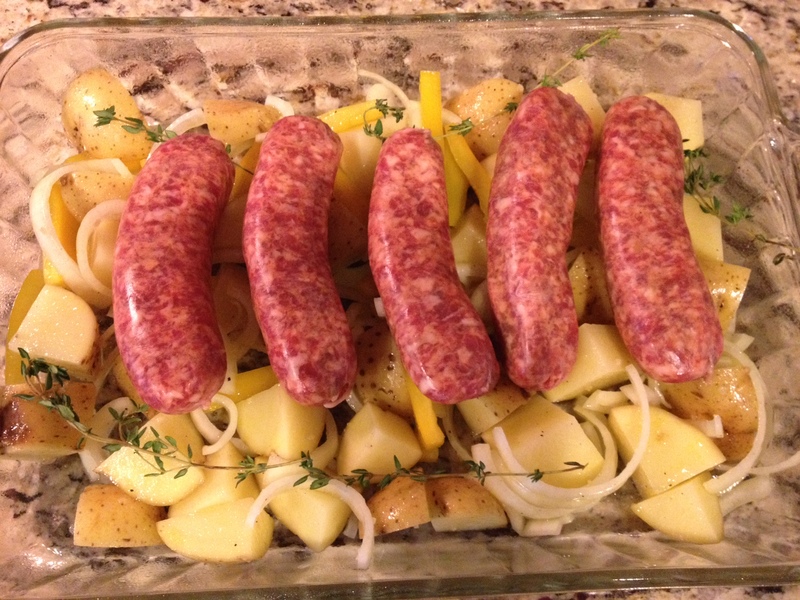 Sausage and potatoes gives you your main course and side dish with some great flavoring from the peppers and onions. We generally will make a side salad to go with this as well. If you have someone in your house on a gluten free diet, this dish is perfect for you! Fixing to cover and head into the oven. A couple of notes for you. Do not cut up the potatoes too small or they won’t hold up well after two hours. I try to stay between 1.5 – 2 inch pieces. Also, the first couple of times I made this I added the tomatoes at the beginning, as the source recipe called for. They definitely don’t hold up for that long. They still had flavor, but they were too mushy for my taste. So I add them at the 90 minute mark when I remove the foil. They hold up much better that way. We also use sweet Italian Sausage instead of spicy as that is just our preference. And if we ever have leftovers with this one, which is rare, I turn it into a sausage and potato hash with eggs for lunch the next day. Yum!!! Preheat oven to 400°F. In a large baking dish, toss potatoes, bell peppers, and red onion with one tablespoon olive oil and chopped garlic. Mix well until incorporated and salt and pepper to taste. Place the sausage links on top of the vegetables. Place sprigs of thyme throughout the dish. Cover with foil and bake for 90 minutes. Remove foil from baking dish, add the tomatoes, mix vegetables around, and bake for an additional 30 minutes (flipping sausages halfway) until the sausage is golden brown. Recipe slightly adapted from Katie’s Cucina. 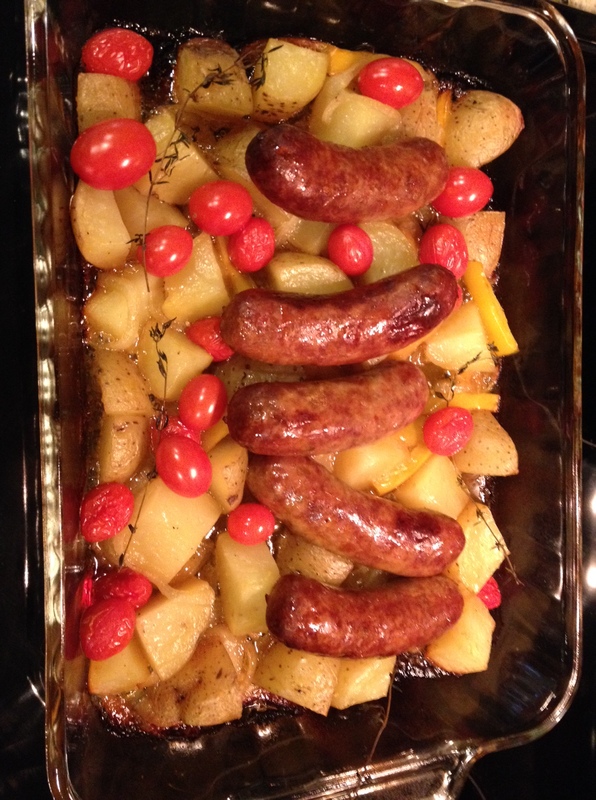 This entry was posted in Entrees, Gluten Free, Pork, Sausage and tagged easy, GF, gluten free, gluten free main dish, gluten free recipe, Italian Sausage Bake, One Pot Meal, sausage and potatoes. Bookmark the permalink. Love and simple! I wish more people realized that cooking a meal isn’t difficult, and worth spending a few minutes on! Thank you Chef Mimi! And I couldn’t agree more! Yes they are! And thank you! Ahhh sausages… make everything better =D Love this plate, it’s perfect for a Sunday meal! Have a lovely day! Thank you Ely!! It makes for an excellent chilly Sunday evening meal.